For today's card and video I have made a card using the joseph's coat technique. I have seen quite a few cards made with this technique and watched a YouTube video by Dawn Griffiths a SU Demo from America where she showed how to do it, So thank you Dawn for the inspiration! The team that I belong to the Crafty Cupcakes has a team challenge every month with a different theme and this month it is a tic tac toe board. So we have a choice of 9 colours and can chose a line going straight, down etc. I decided to go with Emerald Envy, Melon Mambo and Chocolate Chip and couldn't think of a better way to use these colours together. In my video I decided to use Early Espresso as my dark colour as the Chocolate chip still showed some of the brighter colours underneath. the script style of the font. 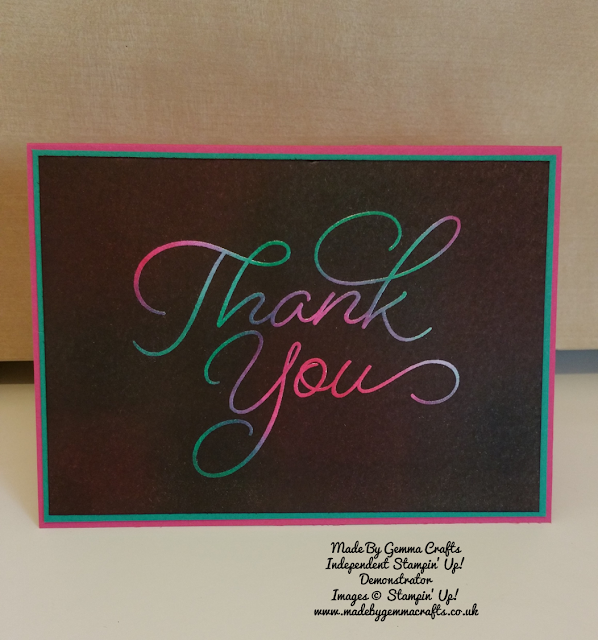 Its a great Stamp for making really simple yet stunning thank you cards. A card blank, Mine measures 5 3/4" by 8 1/4" scored on the long side in the centre at 4 1/8"
A piece of Emerald Envy card that measures 4" by 5 5/8"
A piece of Whisper White card that measures 3 7/8" by 5 1/2"
2 different coloured inks, again I have used Emerald Envy and Melon Mambo. Versa Mark and clear embossing powder. There is still time to join in with the Sale-A-Bration! All you need to do is shop with me and spend £45 or more to qualify for FREE product, it really couldn't be easier!